Snowshoes make it fun and easy to walk through snow! In Canada and in Northern Europe recreational use of snowshoes has become quite popular, although their use by native peoples predates modern history. 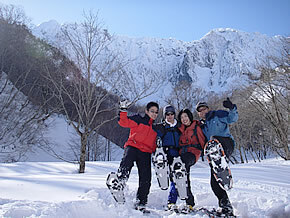 Modern snowshoes have a variety of intended uses, from snowy plateaus to deep forests. Wherever you use them, they make playing in the snow a truly unique experience. Forest and Water offers a variety of tours that vary in length and difficulty. These include Half and Full-Day tours, along with Short and Private tours. Depending on your needs we can design a tour especially suited to your needs. This course allows you to see first hand natural phenomena found nowhere else in the world. The famous of Ichinokura mountain stream, the ice stalagmites of the 'Big Ghost' cave, and the quiet Acorn Forest are all fun and challenging possibilities! For an amazing adventure that everyone can enjoy, we recommend the Half-Day Tour. All ages are welcome! If you want to get the most out of nature, please come and play in the snow with us! If you're worried that the Full-Day Tour might be too demanding, this is a great alternative. We strongly recommend the Short-Day tour for people who love to eat lunch in the snow! Copyright 1998-2009(C) Forest & Water Co,Ltd.